Under the heading Come to Toledo a series of illustrated articles will appear in The News-Bee. They will set forth in word and pictures the things that make Toledo a good city to live in, a good city to visit and a good city in which to do business. What does Toledo mean to you? Just a name, just a dot on the map? Just a place where people live and work? Or does it stand in your mind as one of the most beautiful cities in the world, the city with the finest schools, the loveliest homes, the best play places, the richest trade territory, the most stable commercial structure, the greatest opportunities for health and happiness? A hundred cities in one! A home city! An industrial city! A great financial metropolis! A shopping district of the first magnitude! A wholesale market that serves a mighty and growing empire! A mecca for artists and artisans! The nerve center of mid-west transportation! The gateway of agricultural prosperity! The outlet of untold resources in coal and iron! The city of today and tomorrow! It was all part of Achievement Week, which opened on May 23, 1927, just days after the flight of Charles Lindbergh across the Atlantic electrified the world – and The News-Bee, judging by the prose it heaped on The Lone Eagle. 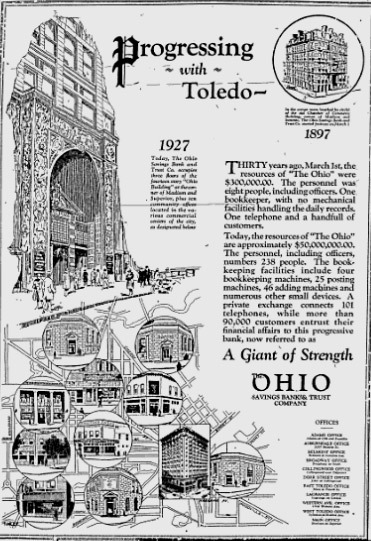 The ads highlighted such matters of civic pride as churches, the Chamber of Commerce, and Toledo’s place as a manufacturing titan and shopping center for the region. Naturally, the News-Bee took the opportunity to state its stance on what it believed would make Toledo better: a city manager form of government, emphasis on institutions like the art museum and the zoo, street improvements and “more workable” traffic, a St. Lawrence waterway ship canal (which didn’t happen for nearly 30 years) and a new Maumee River bridge, among many other things. Staff writers wrote about the industries and institutions that made Toledo great: Libbey Glass, the Art Museum, and long-gone industries like the oil field equipment manufacturer National Supply Co. which ended operations at its facility at Bishop and Albion streets in 1959. Not to mention the Whippet Mystery Car. (STARTS-DRIVES ITSELF-STOPS-HOW IS IT DONE? NO CONCEALED DRIVER, NO RADIO, NO ELECTRICAL CONTROL) It was available for viewing at the Willys-Overland branch at Adams and 14th. A typical Achievement Week ad, from the Ohio Savings Bank and Trust Company. A little over four years later, the bank that billed itself as A Giant of Strength failed on an August weekend along with three other Toledo banks. Prominent business and civic leaders also wrote front-page editorials. 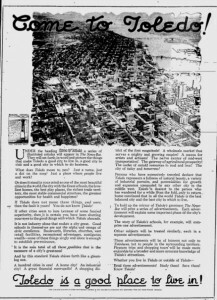 Mayor Fred Mery wrote about, among other things, the city’s plan to make a motorway out of the Miami and Erie Canal (today’s Anthony Wayne Trail). John N. Willys, President of the Willys-Overland Company, wrote about the importance of buying local. Thomas A. DeVilbiss stressed the importance of adequate traffic facilities. The News-Bee series is a reflection of the postwar boom enjoyed by Toledo as well as the rest of the country (and while we’re at it, let’s recognize it was self-promoting and designed to sell advertising, too). The possibilities of the future Toledo must have seemed endless, even with the world growing smaller: the infant known as radio was just beginning to walk, and the crossing of the Atlantic by Charles Lindbergh ignited the city’s imagination. 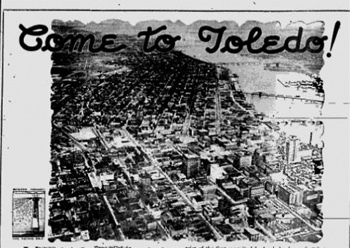 Like Lindbergh, Toledo was flying high in 1927. Its population had exploded from 168,497 in 1910 to 290,718 by 1930. Its factories churned out a million dollars of goods daily. Achievement Week ended on Memorial Day. It was followed by Forward Week, but no one could see what the 1930s actually held: it would only be four years until Toledo and its citizens would be in a desperate situation.